Gunmen launched what appeared to be coordinated shooting attacks today at Iran’s parliament and the shrine of Ayatollah Khomeini, the spiritual leader of the Iranian Revolution, according to Iranian media. One of the attackers reportedly blew himself up in a suicide bombing while attacking the shrine. 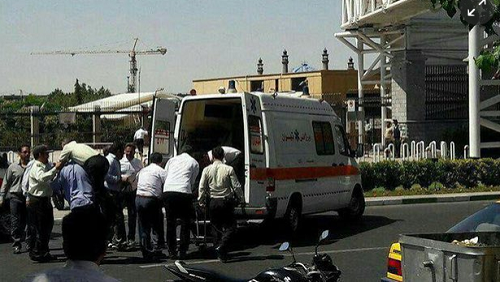 At least one guard was killed when a gunman opened fire in hallway at the Iranian parliament in Tehran, the Tansim news agency said. Several others were said to be injured. Shortly after the shooting broke out at the parliament, a second gunman was reported to have opened fire at the Khomeini shrine a few miles away. The mausoleum houses the body of Ayatollah Khomeini, the first leader of the Islamic republic, and is highly symbolic site for Iran’s theocratic leadership. It was not immediately clear who the gunmen were nor their motivations for carrying out the attack. Iran is fighting against the Islamic State of Iraq and the Levant (Isil) in Iraq. The jihadist group considers Iran’s Shia majority population to be apostates and worthy of death. However, Iran has also faced attacks from the People's Mujahedin Organisation of Iran (MEK), a Leftist militant group, and from Kurdish insurgents in the west of the country.